Tintswalo Safari Lodge has added to its portfolio of ‘Explorer Suites’ with the launch of a new two-bedroom family suite in the Manyeleti Game Reserve, bordering the Kruger National Park. Aimed at families and friends travelling together, the new Grant Suite is connected to the main lodge by a raised wooden walkway that winds through the bush. It offers two en-suite bedrooms with lavish bathrooms, and a spacious lounge with private deck and a large plunge pool overlooking the wilderness. 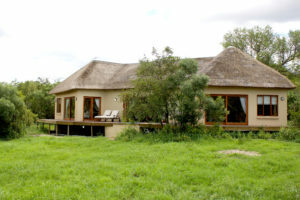 Designed in the style of a villa to provide guests with a comfortable ‘home-away-from-home’, the Grant Suite includes luxury accommodation, all meals served at the main lodge, house drinks, two private game drives per day in a private game-viewing vehicle with a dedicated tracker and guide, as well as complimentary Wifi and laundry, at a set rate of R43 160 per night for the unit (valid until 30 November 2017). Accommodating children from the age of 9 and older in the Grant Suite, Tintswalo Safari Lodge offers a tailor-made children’s programme, which aims to provide young visitors with a fun, educational perspective of the African bush. Daily themes focus on different educational aspects of the bush, ranging from South Africa and the Shangaan Culture, to tracking and stargazing – with each theme consisting of a talk, game drive and an exciting activity. Each of Tintswalo Safari Lodge’s suites have been designed to evoke the colonial adventures of the 19th century explorers after which they are named. The new Grant suite takes its name from James Augustus Grant, a Scottish explorer of Africa who spent much of his time traversing the continent with the renowned John Hanning Speke, in search of the elusive source of the Nile – every explorer’s ‘holy grail’ quest. Grant was known for his commitment to Speke’s voyage, his loyalty, and his resilience during challenging times.